In this assignment we collected stories from our fellow students about their journey of traveling to Carnegie Mellon for the first time. 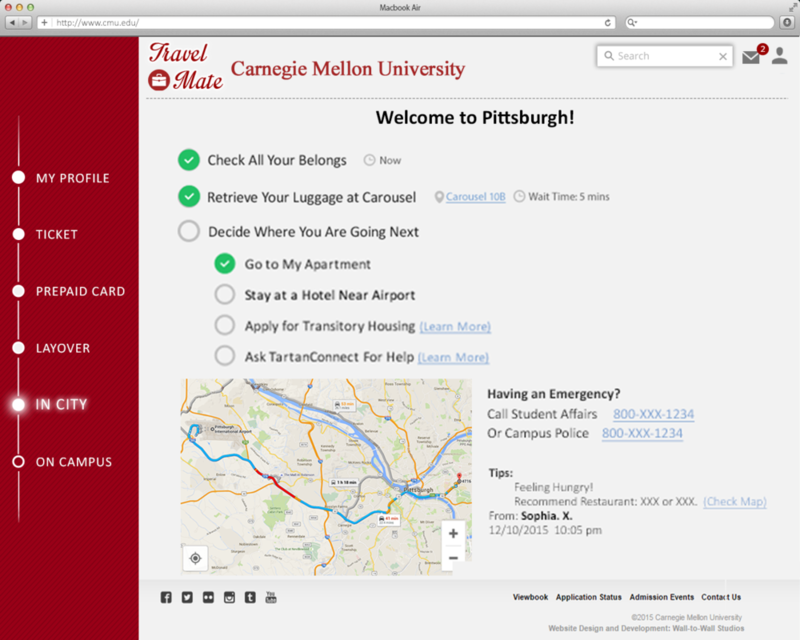 Based on these stories, we designed a new site for CMU to offer a better experience for incoming students. Carnegie Mellon University (CMU) has a very diverse student body. Each semester, thousands of student travel to CMU's Pittsburgh campus from all over the world. The university's current "Visit CMU" website only offers limited information and support to meet students' needs. Travel Mate is a "disaster-prevention agent" that is customizable according to students' profiles and goals. It is location-based, and offers tailored reminders and suggestions during different stages of the trip. The service is also responsive, providing easy access for both mobile and desktop. We interviewed 4 CMU students for their experiences of getting to campus. They come from diverse backgrounds and travel from very different places. Through interviews and follow-ups, we identified several crucial "pain points" of CMU's current website, which laid the groundwork for our subsequent designs. Our interviews indicated that international students tend to have more difficulties getting to campus, thus we decided to focus on the experience of international students. To better document students' journeys, we generated a present customer journey map with key actions, touchpoints, and breakdowns. Then we analyzed information on hand and created a future customer journey map to represent the ideal state. To fill the gap between the present and future customer journeys, we started to brainstorm for ideas and produce wireframes. We adopted a "Mobile First" approach to accommodate the needs of users when they are on the move.